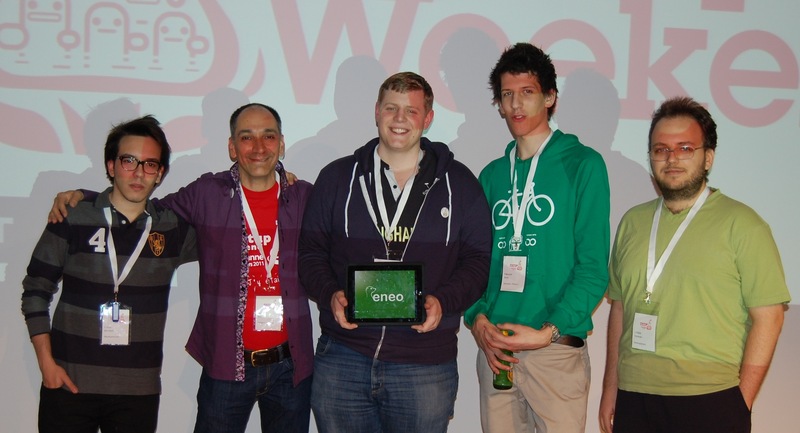 This past weekend I participated in the Startup Weekend Lausanne 2011, my first startup weekend ever. It was amazingly interesting. I worked on an application called Eneo. Eneo allows you to talk with people around you using your mobile phone, people that you don’t know, so the next time you are stuck at the airport waiting in a 3 hours delayed flight, you don’t have to eat alone. Find someone else in the same situation and go for lunch. I think the application has great potential and I was told that the jury didn’t understand it. I don’t know, they spoke in french. Supposedly the event was going to be in french and english but was all in french… I was bored when I wasn’t coding. I’m thankful I didn’t present an idea, I would have done a poor job of doing it. I now wrote a list of things to do when presenting an idea. I was going to publish it, but it’s gold so I’ll keep it to myself, at least, until I use the techniques. Muahahaha. I chose a company to work with, but the guy with the idea decided not to work on it because he didn’t get enough people. It was him, one designer and me, a programmer. I was surprised. Then I saw most groups were more than 5 people, some may have been even 8. For me that’s absolutely crazy. The startup sizes that make sense for me are 2, 3 and 4. Any less and it gets lonely (tell me about it! ), any more and it gets crowded. When the group I was in disolved, I turned into a free developer and the four or five groups that didn’t get a developer already started to pitch to me (now they did speak in English ;), at the same time. It was crazy. I think I got a glimpse of how investors feel. At any rate, immediate ego boost for a developer. If you are a developer I recommend to attend this events, is great for you and great for the event. While working on our project I did make some mistakes. One was working on a mobile application. I haven’t done mobile in a while, I’m not fast at it; not weekend-fast at least. Give me a week and I’ll be rocking your phone, but in a weekend, no. I decided I wasn’t going to code, but I’m a coder and in less than two hours after joining Eneo I was writing code. I paid a step price when I tried to make the application look mobile by using jqtouch. I never used jqtouch before so there were a lot of things not working and I wasted precious hours on it. Big mistake. My second mistake was trying to make a product. I wanted to woo the jury by showing an active product with users already. I failed to do that. I should have gone straight to coding a demo, not a finished product. What we ended up with was half product half demo, not good at either. Next time I’ll do better.